Reading is fun and during my past time I read my favorite books. I bought quite a lot of books written by famous authors. It's quite expensive when you buy them on the bookstore but I found out that I can also buy the books I've always been collecting by going through online at http://www.sellbackyourbook.com which sells used books and guess what they also Sell Back Books on a reasonable price. This store also buy all kinds of new and used books. Visit them to find out how. A home is a very good investment. You build wealth and you build memory. So we bought a house decided to fix it and rent it to people whom we trust to take care of the house just like taking good care of their own house. Now that we have done it we expect that everything would be fine and suddenly here comes the big mistake. Besides from ruining the house by not cleaning, dog pee on the floor, dog scratch on the door turning the house into a pigsty. I blame those parent's who didn't teach their children because of what these people did. What could be more worse is that the attitude of the children of their children will be the same if they didn't change. What will happen next? It would be very nice then to have known this E-rate program to evaluate the speed of the computers Internet in the library where I worked before. We could have known very well how our school rated for the deliverance of Internet speed so student and faculties could have a better learning experience by using this e-rate. You might want to use this information by visiting their web site at http://www.trillion.net/. Is your immune system okay? It's the usual time of the year where climate change and of course colds are getting in our way. We can avoid colds by eating a delicious mouth watering yogurt. This is what I learned and wanted to share to you. Researchers in Sweden have discovered that you can make yourself 2 1/2 times less likely to catch colds from now on simply by eating yogurt. I got this source from The MD's guide to healing foods. There's nothing worse in finding out without the programs on your PC that the memory will only hold about 300 pictures. I couldn't wait for the day to be all to buy additional computer memory for my PC. I even went out and bought a new camera with the intentions of filling up with new memory. Luckily we have high speed Internet access because I'm always slowing down. It's always good to defrag your PC memory along with deleting all useless files stored on your PC from the Internet. If it wasn't for our air purifiers sometimes I can't open my eyes besides my sister's cat and my dad's workshop in the basement. Thank goodness for our IQAir purifier. It's amazing how much difference there is in the air quality in the room. I usually have two air purifiers turned on in the spring and also in the fall when the pollen seems to affect me the most. Thank you IQAir. Oh no!!!! get rid of it! The words that I said to my husband when he showed me the snake skin he found on our shed the other day while on his other hand is the snake who shed that skin about 36 inches long. I was really freaking out. I don't care if it's a grass snake I won't touch it and it's really scary. The snake probably more scared than me because he run away so fast when my husband let go of him. From then on I double checked on my son every single minute whenever we were outdoors playing on the back yard. Don't want any of them close to my son. Uh! uh! Teaching our kids in an early age is the best way for them to grow up as a proper person. Teaching them to respect the environment is one example. Respect the Eco just like respecting each and everyone of us. That's why going green is in the best interests of my family and encouraging our child to join in green kids movement by engaging them to an activity such as recycling materials instead of throwing away things that might be of use. http://www.freshandgreen.com/ has many products such as an indoor gardening kit made from recycled milk jugs that would interest my son by doing activity that can relate to helping the environment by gardening. You too can have fun with your kids by visiting the cool, hip, home, personal care, clothing & more green products by visiting them online. Do you like watching sports or are you engaged in sports? My husband liked to talk about sports and getting together with a bunch of guys especially when the wife is not around and have a few extra bucks on your card that can tempt other guys to take the bet. It's so funny when they throw out incredible odds on a game to see how many guys will take you up on it. Talking about sports is a big topic when it comes to discussion. That's why he is just so ecstatic when a sports social network has been launched online where he can share his Sportsviews. He can't type very good so when we go to the site he dictate and I type and boy he can talk about his team. The fantastic pictures of the cheer leaders is kind of a distraction he said but he love the distractions. Putting downloads of pictures he have taken is great. It allows a chance to get comments from other guys which is the best. It's fun to type an argument. You can always join on the discussion because it's free, making new friends is fun too. In closing don't you think Joe Montana has too much of a swelled head? Thanks. I just happened to find one of my old pictures way back in the Philippines during the Librarian's seminar in Aurora Baler where I attended. After our session we take a walk and ended up in the park wherein a country's Millennium Tree centuries-old balete can be found. 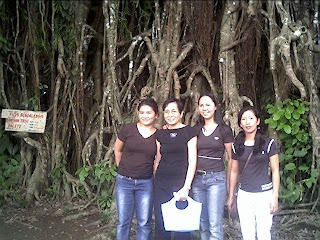 "This park contains a 600-year-old balete tree that was designated the official "Millennium Tree" of The Philippines. It is the largest tree of its kind in Asia, and it would take 60 grown men, holding one another at arm's length, to encircle its gigantic trunk. Due to its age, the tree's thick roots have grown above ground, such that caves have formed under various sections of the trunk. This unique tree has generated national media attention and is now the most visited tourist spot in Aurora." My friends dared me to go inside the cave but I got really scared thinking I might get lost inside and never get out (lol!) Check this out. Our skin is working overtime. It rests by the middle of the night when you are off to bed. Here's how to boosts your looks while your body rests. A new skin care product from Chantal Pharmaceuticals offers users a solution for anti-aging with long-term result. Unlike any other products, this new breakthrough is very different from those creams and cleansers that simply plump the skin for several hours, offering users only a temporary fix. You probably doesn't want that. Dr. Chantal Burnison, a very important person, a woman with great talents and with her pharmaceutical company had come up with skin-rejuvenating molecule called Ethocyn which is helping both men and women reduce the natural effects of aging on their skin’s appearance. Originally created to accelerate the healing of wounds, the Ethocyn molecule also demonstrated the ability to reduce fine lines and wrinkles in skin. Burnison decided to expand upon this discovery and developed a cosmetics line through her company, Chantal Pharmaceuticals. It's really great! My in law called me up last Friday and invited me to go out and go shopping today. She came over to pick me up and then we went to my daughter-in-law to get her too so we all go together on a car. We went to Christmas tree store and buy lots of Halloween stuff. After all I picked out what i liked she insisted on paying for them. Wow! I really have a nice in law. Not only that after were done shopping we went to Fresno restaurant and ordered our food. She paid for all the food that we ordered. The girls day out is so much fun I am glad we made it today after cancelling the previous one. She brought us home and my daughter-in-law and thanking her for the treats that we have. One morning my friend called me saying she was already discharged from the hospital. Before she was admitted in the hospital she had an extreme pain in her lower back. She was complaining about it for many days and thought it was only a minor pain. She thought she had a pulled muscle and actually it ended up being a kidney infection. She ended up in the emergency room. There was so many test. But then after the second day they found the problem and if it wasn't for for her North Carolina health insurance she said she'd probably totally broke or worse than that and she was very thankful for that health insurance. The key to never losing spare keys is to attach hooks to a picture frame to keep them centralized. Choose a sturdy wooden frame . You can buy from a hardware store a few small cup hooks to use. When you got all that is needed push your cup hooks into the frame (on the side opposite the frame's hanging hardware) and twist until they're secure making sure the hooks face forward. Pop your favorite photo into the frame and hang near the doorway. I hope this tip would help you to keep track of your keys. 1. Our body is out of balance which means it's not functioning normally. 2.Our immune system is weak which means it's not functioning normally. 3. Toxin's are getting into our body. On the other hand we have to eat proper foods to make us healthy.